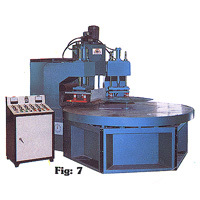 High accurancy of turntable: The machines employ a turntable which minimizes error. Working speed can be adjusted by means of a timer, loss time is completely eliminated to greatly improve work efficiency. Machine operation is simple, requiring no technical skills. Spark protector eliminates machining loss. Dust on working piece or over high frequency may cause sparks, so that the mold may be damaged. Processed may produce sparks. The machine detects the sparks instantaneously by means of a super high sensitve spark preventor and interrupt the supply of high frequency waves. Thus the operator can eliminate loss and damage of molds and materials. Other machines such as 50KW, 80KW are perfect manufactured. We reserve the right to alter technical specification without notice. Design and manufacture high frequency machines High Frequency PVC Welding Machine. High Frequency Wood/Rattan/Bamboo Bending and Gluing Machine. High Frequency Induction Heating Machine. High Frequency Steel Pipe Making Machine. Hot Air Seam Sealing Machine.